The input module is in charge of the expression of recombinase according to the received signals. When there’s no input signal, there is leaky expression. Such leakage may unexpectedly alter the function of the processing module. So we need tighter regulation. We cloned the recombinase under the control of the inducible riboregulators (Callura et al., 2012; Bonnet et al., 2013). The site-specific recombination system we used in our project is Cre recombinase meditated inversion system. We chose two mutant loxP sites, lox66 and lox71, instead of the wild-type loxP sites. After the first Cre-mediated recombination, one wild-type loxP site and one double mutant loxP site are generated. The double mutant loxP site, lox72, exhibits a very low affinity to Cre recombinase. So it can be regarded as a unidirectional one, or an irreversible one. In a riboregulator, the cis-repressed RNA is like a lock, and the trans-activating RNA is like a key. 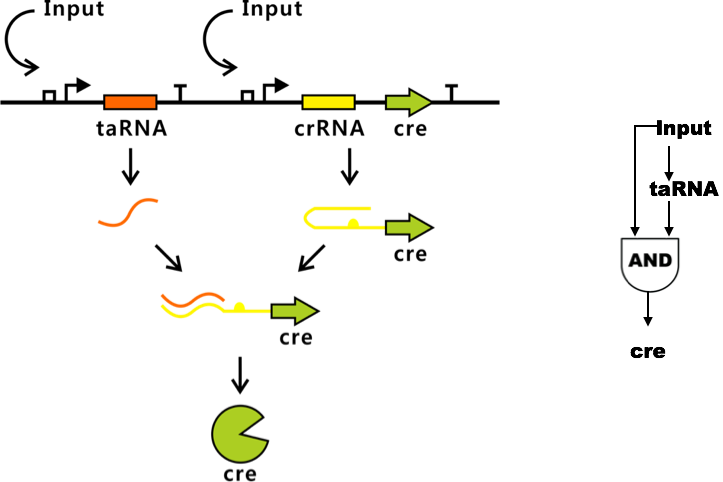 When they reach a certain concentration, the trans-activating RNA is designed to target and hybridize to the stem-loop of the crRNA message. The resulting RNA duplex causes a conformational change in the crRNA that unfolds the stem-loop, exposing the RBS and permitting translation. In this way we can achieve a post-transcriptional control. 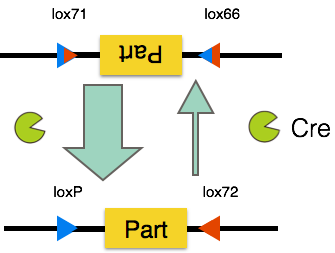 We incorporated a coherent feedforward loop into our input module. This motif can provide pulse filtration in which short pulses of signal will not generate a response but persistent signals will generate a response after short delay. So we utilized this property to filter noise. Siuti, P., Yazbek, J., & Lu, T. K. (2013). Synthetic circuits integrating logic and memory in living cells. Nature biotechnology, 31(5), 448-452. Callura, J. M., Cantor, C. R., & Collins, J. J. (2012). Genetic switchboard for synthetic biology applications. Proceedings of the National Academy of Sciences, 109(15), 5850-5855.